In the fluid power sector, hoses permit connection of the various components and fluid power systems without using pipes. To guarantee system safety, these items must be replaced periodically and hoses, therefore, represent one of the most widely used components. These products are designed to combine flexibility and great strength (assured by the mesh inserted inside these). The vast range of hoses and fittings, manufactured according to current quality standards, guarantees constantly high performance. 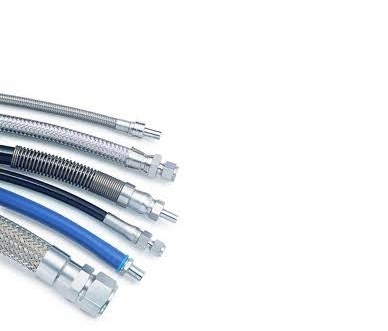 At the RVS deposit in Turin, you can purchase different types of hoses, available in a range of different sizes and complete with fittings for connection to customers’ fluid power systems. Company technicians are available to assist customers with a personalised consulting service. For further information regarding the range of products and components sold, contact RVS: you can ask to view the complete catalogue of the hoses and fittings of the company that operates all over Italy.